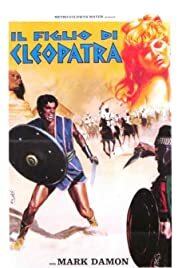 I was also pleasantly surprised with this meticulously staged production, made in the wake of Joseph L. Mankiewicz's "Cleopatra", the legendary Fox historical spectacle for which no money was spared to bring a visually rich motion picture to the screen. This tale of El Kebir (or Cesarion, the son of Cleopatra and Julius Caesar) leading rebel Egyptian tribes against a tyrannical Roman governor is mostly an outdoors action drama, and whatever is set in interiors does not require lavishly rich sets and decoration since the scenes take place in desert tents and public officers' houses. Add location shooting in Egypt, hundreds of extras and you have a typical 1960s wide-screen and color adventure drama. Against what I have read about Mark Damon's performance he is equally fit as a handsome action leader (not precisely a mythological demigod, but a freedom fighter) and as a more complex character than the usual muscle-man fighting evil queens and emperors. There are also more interesting characters (even if they fit the usual stereotypes of right and wrong doers), played by an excellent cast of Italian and Egyptian actors; and firm and straight direction by Ferdinando Baldi. What is unfortunately lacking is chemistry between Damon and leading lady Scilla Gabel, as Livia, the Roman governor's daughter who falls for the dark-haired and green-eyed prince of the desert: their interaction is simply another element of the plot, since there is no passion or romantic energy in their scenes. Carlo Rustichelli's score is a plus, providing the romantic touch lacking in their performances, and adding a dimension reminiscent of the European westerns, with a melancholic trumpet leading the main theme. Watch it, it is quite enjoyable.